LocationThis hotel enjoys a central location at 37 West 24th Street (between 6th Avenue and Broadway) in Manhattan's fashionable Chelsea neighbourhood, in the heart of Manhattan's beloved Midtown area. 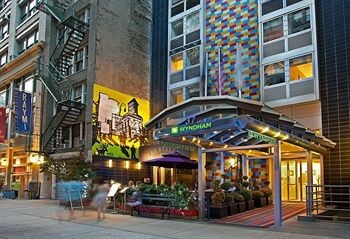 Links to public transport are a couple of minutes' walk away and the property is just walking distance from exciting New York City attractions and landmarks, such as the Flatiron Building, Union Square, the Empire State Building, Macy's, Fifth Avenue shopping and Madison Square Park. Others important places are also nearby, such as Radio City Music Hall, the Theater District and Rockefeller Center. Guests can stroll over to Times Square, Broadway Theatre District, Carnegie Hall, Lincoln Center, the United Nations and the Museum of Modern Art. Guests will find restaurants and bars in Soho and the Meatpacking District, about 7 minutes' drive from the hotel. The Hudson River is 8 minutes by car, as is Central Park. Long Island is 12 minutes away, as is the American Museum of Natural History, the Statue of Liberty ferry is 20 minutes' drive and it is 45 minutes by car to Long Beach.FacilitiesThe establishment comprises a total of 124 accommodation units. Guests of the establishment are welcomed in the lobby, which has a 24-hour reception and a 24-hour check-out service. The upper floors are easily accessible using the lift. Amenities include a safe. Internet access is available in public areas. Gastronomic options include a restaurant and a bar. A newspaper stand is also among the amenities at the establishment. A garage can be used for parking (for a fee). Additional services include room service and a laundry.RoomsAll accommodation units feature air conditioning, central heating and a bathroom. The carpeted accommodation units feature a double bed or a king-size bed. A safe and a desk also feature. The rooms offer a range of amenities, including tea and coffee making equipment. An ironing set is also available to guests. Each accommodation unit offers internet access, a telephone, a TV, a radio, an alarm clock and wireless internet access. Each of the bathrooms features a shower, a bathtub and a hairdryer.Sports/EntertainmentGuests have plenty of recreational options, with a range of sport and leisure opportunities. Variety is offered by the range of sports and leisure options available at the establishment, including golf, a gym, a spa and a beauty salon. MealsVarious meals and board options are bookable. Guests can choose from breakfast, lunch, dinner and full board. The establishment additionally offers snacks.PaymentAll major credit cards, including American Express, VISA, Diners Club, JCB and MasterCard, are accepted for payment.